Geared toward community centers, museums and other organizations that have a lecture series. The visual presentations range from topics in art history to lectures by various artists about their own work. These include what inspires the artist, their artistic process, and a retrospective view of how their work has evolved over time. Call (231) 378-4963 to schedule and for more information. 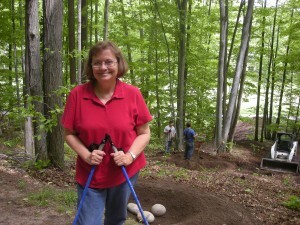 Patricia Innis is an environmental artist and painter who has exhibited her paintings and participated in environmental art projects throughout the Midwest. She received her Bachelor of Fine Arts Degree from Bowling Green State University and Master of Fine Arts degree from Maharishi International University. As a committed educator, Innis has been a University Professor, curator and gallery manager. She is currently the Director of Education for Michigan Legacy Art Park. This illustrated lecture starts with an examination of the monumental art forms of the 1960’s, such as “Spiral Jetty”, that initiated the contemporary Land Art genre. It will trace the development of that genre from the sculpture of Robert Smithson and Michael Hazier among others through the work of Andy Goldsworthy. It will conclude with the construction of Innis’ land art sculpture at Michigan Legacy Art Park. Dewey Blocksma was home taught growing up overseas. 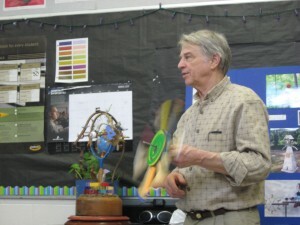 He entered this culture at age 11 as an observer and maker of toys. After a career in Emergency Medicine he returned to the world of toys and art in 1980. Inventing a universe of Dutch Cowboys, Violin Women and wind machines, Dewey lives in the woods with his partner Sandra Hulst near Beulah. Surrounding themselves with the works of friends and an endless variety of objects and tools, they make their way through the day hoping that the making of things will coax some of life’s mysteries out of the shadows. In this visual presentation the basic physics of wind machine design will be introduced followed by an exploration of whirligigs in art with anemphasis on the work of Vollis Simpson. Using a series of images of my own work, the presentation will attempt to explore simple ways to build wind machines using them as a platform to expressperson stories.